Some individuals are born colour blind but others through the course of their lives find their ability to differentiate between varying colours becomes impaired especially if they are suffering from an underlying condition such as a chronic ailment like Fibromyalgia or M.E (Myalgic Encephalomyelitis). 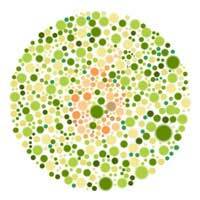 Colour Blindness or Colour Vision Deficiency as it is also known is the inability to perceive some colours which many of us take for granted. The condition itself can be caused by a genetic defect and can be present from birth but – as we have already mentioned – there are certain medical conditions and indeed medications which can lead to colour blindness. Colour blindness can occur as a result of damage to the eye, the nerves of the eye or indeed damage to the brain but as we have already mentioned it can be brought on by other conditions which cause more than one symptom to be prevalent in the sufferer. We have already looked at Light Sensitivity and how it can become a factor in the lives of Fibromyalgia and M.E (Myalgic Encephalomyelitis) sufferers. The same can apply to Colour Blindness. Where the sufferer may find they have an aversion to bright light they may also find as a result that their ability to differentiate between colours with which they have previously no problem is impaired. In some instances this problem is a temporary one or it can be something that continues throughout the sufferer’s lifetime. Indeed they may also find that other problems with their eyes may become apparent such as conjunctivitis. Sufferers of conditions such as Fibromyalgia and M.E (Myalgic Encephalomyelitis) may also experience migraine headaches which themselves exhibit signs of colour blindness. Indeed some migraine sufferers experience what is known as ‘transient colour blindness’ which means that during a migraine headache their vision becomes blurred and they see what looks like misty hues around anything they look at. Colour Blindness – just like the conditions that may bring it about such as Fibromyalgia and M.E (Myalgic Encephalomyelitis) – has no cure. However you may find that your optician may be able to help you with tinted lenses which can improve your ability to differentiate between colours. It is important to remember however that this is something which does not always work and therefore before embarking on such a course of action you discuss it with both your doctor and optician. If as a sufferer of Fibromyalgia or M.E (Myalgic Encephalomyelitis) you have begun to experience colour blindness – even if it is during a migraine – then you should consult with your doctor as soon as possible. He or she may be able to define the root cause and help treat it – if it is related to the migraines. However as always with conditions relating to Fibromyalgia and M.E (Myalgic Encephalomyelitis) there is no sure fire way of alleviating the problem so it is important to discuss all the options with your doctor and indeed your optician as and when you can.